ASK-EHS Software is a environmental health and safety solution for analyzing EHS trends, viewing real-time, visual reports, and managing tasks and compliance. The multi-featured application provides a range of modules to help businesses manage their EHS needs including incident / near miss reporting, corrective and preventive action tracking, internal audit management, site inspection, EHS training management, and more. Designed by EHS professionals to help businesses of all types manage their environmental health and safety, ASK-EHS Software offers features such as legal compliance, inspections management, audits, task management, and analytics from a single platform. 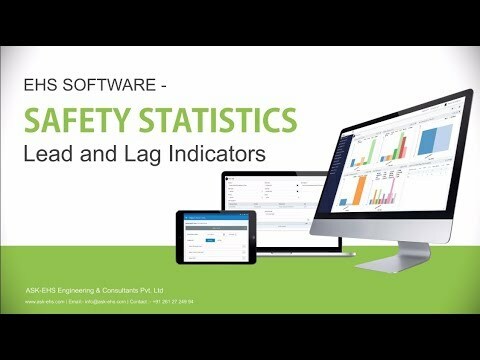 Users can manage, log, and track accidents, incidents, and near-misses within ASK-EHS Software which provides the tools to reports on incidents, investigate them, and analyze them with visual reports. Reports can be generated and customized to gain insight into factors such as incident by time of day, incident by type, causes of incidents, and more, meaning trends can be identified and issues resolved where possible. Analytics can also be generated on injury trends in order to ensure frequency rates are within compliance thresholds. ASK-EHS Software also facilitates the management of tasks with personalized task lists for each employee displaying priority, subject, description, start and due date, status, and action needed. Tasks can be assigned to users by those with permissions and notes or action items can be added to provide guidance to the assigned team member. Training can also be managed within the ASK-EHS Software training module which provides a calendar for scheduling sessions, yearly training goals or requirements, and reports on conducted training, high achievers, and more. Ease in tracking the activities, comprehensive information in the form of dashboard etcIt's user friendly, once training is imparted to the concerned group, it works without further help/guidance, trends are readily available etc.. It's user friendly, once training is imparted to the concerned group, it works without further help/guidance, trends are readily available etc.. This is an excellent & user friendly product with superb customization. Customization & user friendliness. Interphase is easy to use and understand. data can also be fetch in required formats easily. Not anything specific. it is user-friendly, customizable, and very well designed software. No Cons found. Contact ASK-EHS for pricing information. Manage and evaluate the organization's safety performance with reports on incidents and injuries, and reports to identify causes of incidents, nature of injuries, and number of days without injuries. Manage tasks and notifications with the task board which provides each user with a list of their pending tasks including a description, due date, status, and more. Gain insight into business safety and compliance with real-time reporting and custom dashboards to illustrate training, audits, behavior based safety, regulations, and more. Track accidents, incidents, and near-misses with the incident module which provides reports on incidents by time of day, day of week, worker age, type, cause, shift timing, and more. Comply with OSHA and Government regulations using auditing, inspections, and compliance management tools, and identify safety hazards through risk assessments. Below are some frequently asked questions for ASK-EHS Software. Q. What type of pricing plans does ASK-EHS Software offer? Q. Who are the typical users of ASK-EHS Software? Q. What languages does ASK-EHS Software support? Q. Does ASK-EHS Software support mobile devices? Q. Does ASK-EHS Software offer an API? No, ASK-EHS Software does not have an API available. Q. What other apps does ASK-EHS Software integrate with? Q. What level of support does ASK-EHS Software offer?